Don’t just make some noise the next time you go out, what about wearing noise instead? That is made possible thanks to the Tooks Headphone Hats, which is a stylish new kind of beanie which comes with high quality integrated earphones. These are meant to be extremely comfortable, covering your ears totally to keep them nice and warm when it is freezing all around, while providing you with ample audio juice to keep your ears happy. 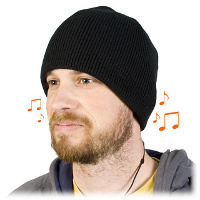 Perfect for joggers, snowboarders, hikers, commuters as well as folks who want to listen in to the radio in private, the Tooks Headphone Hats will come in Chunky Knit Black, Chunky Knit Plum, Classic Black and Classic Pink colors, retailing for £29.99 each. Who the heck is that modeling the hat? I swear to god I must have a twin in this world. It’s inconceivable.